Annisquam Herb Farm: The heat of the sun . . . The heat of the sun . 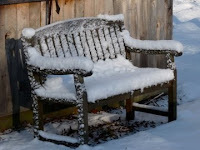 . .
As soon as the sun melts the snow we sit on the bench in the warm sun looking at the garden - planning this year's layout. The seeds started in the house are beginning to sprout - some spinach and onions have emerged. In the greenhouse the chard and spinach from last fall are producing again, the broccoli have small heads forming and a few herbs are showing new growth - enough to add flavor to our meals. There are a few short rows of beets, carrots, mesclun greens, spinach and cabbage. Now the fruit trees are in my sight today - time to spray when it warms up a bit!